Have you ever got up from bed with something running in the back of your mind? A midnight or an early morning dream which keeps returning over and over again when you are about to wake up? A plan, A recipe that you so badly want to execute? It happens with me so often these days. Most of the times I get busy with the daily schedule and I get easily distracted by my active toddler who is about to turn 2. She really keeps me on my toes. This one idea that I woke up with last week of a dessert that I wanted to put together made its way to be set in the refrigerator fighting all the distractions and other chores. I was thrilled. I am so glad I made what I had dreamt while still sound asleep. I am happy I did not forget about it when I woke up in the morning. I am very thankful to my little brain that weaved this dream. I am happy I did not say some other day and made it that day. It looked just like in the dream. It looked just like I thought it would be.. even more beautiful. So what did I make?? 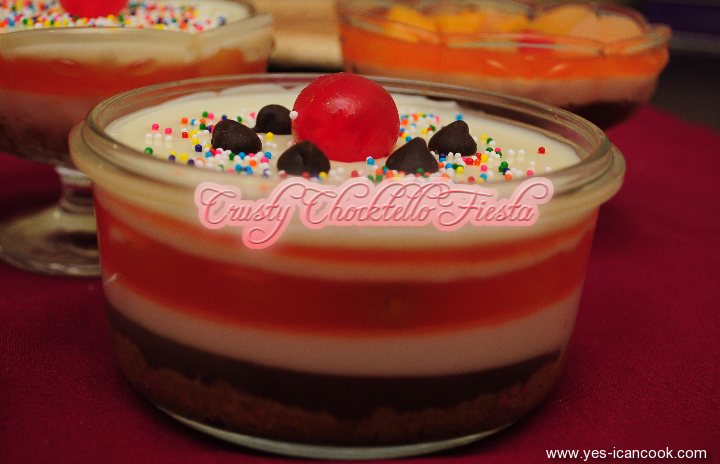 Crusty Chocktello Fiesta.. What?? Yeah that's what I named it. 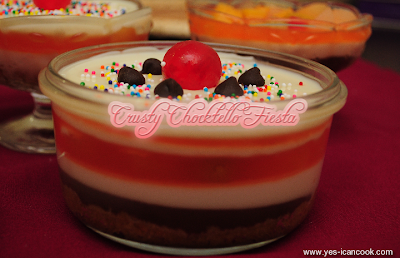 Crusty Chocktello Fiesta!!! Drum Rolls please.. It's a multi layered dessert and the name comes from the layers. Crusty as it has the crust from a cheesecake I made. 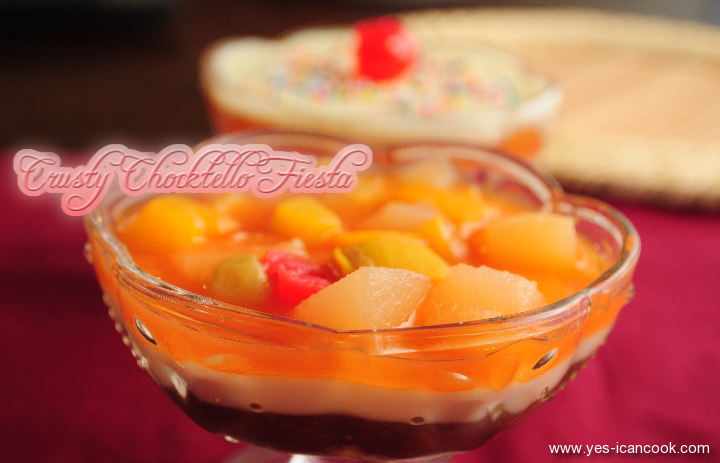 Chock from the chocolate pudding layer and the fruit cocktail layer. ello from the condensed milk jello and the fruit juice jello layers. Fiesta from the name suggested by one of the wonderful follower, Nas of my Facebook page. Call it coincidence but I got a box of sweets that carried the name Sweet Fiesta on it that caught my attention and Nas suggested the name Fiesta at the same time. Now back to the dessert. 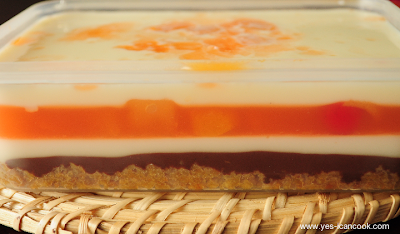 I made this dessert's layers by picking layers from desserts I had made in the past. It was a success. 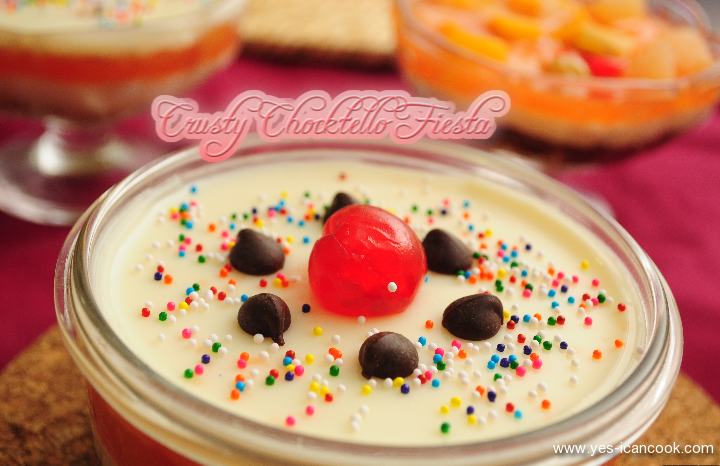 Crusty Chocktello Fiesta tasted luscious, rich, exquisite, heavenly, yummy, tasty.. any other synonym that you know for the word delicious please add it to the list. Loved it. This is a great make ahead dessert and can be served straight from the refrigerator to your guests. The layers can be set one after the other at your convenience and don't have any maximum lead time. You can set the layers in any order you like. You can omit any layer if you do not want to add it. The recipe appears long, tedious and time consuming but it is not. It is easy and fun to make and needs short intervals of your active time. 1. 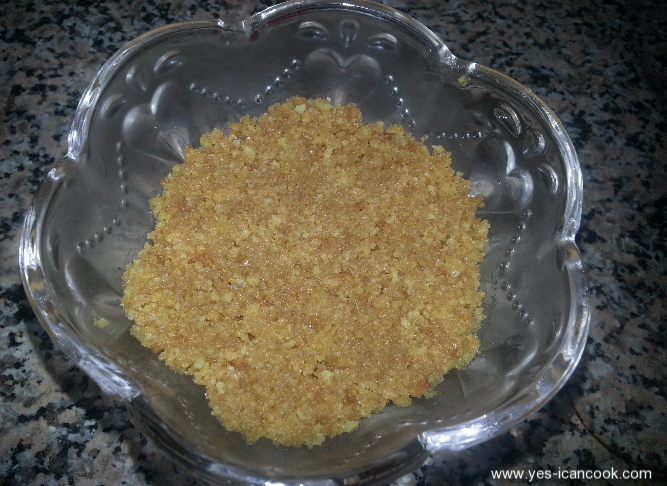 In a mixing bowl, Crush the digestive biscuits to make a coarse powder. 2. Add sugar to the crushed biscuits and mix well till combined. 3. Melt butter in the microwave or on stove top. Cool it down and add it to the crushed biscuits. 4. Mix with a spoon. Crust is ready. 5. Place the crust in the base of the serving bowls. Level it with the back of a glass or a spoon or with your fingers. 6. Cover the bowls with cling wrap and refrigerate while you prepare the next layer. Let it refrigerate for at least 20 minutes. 2. 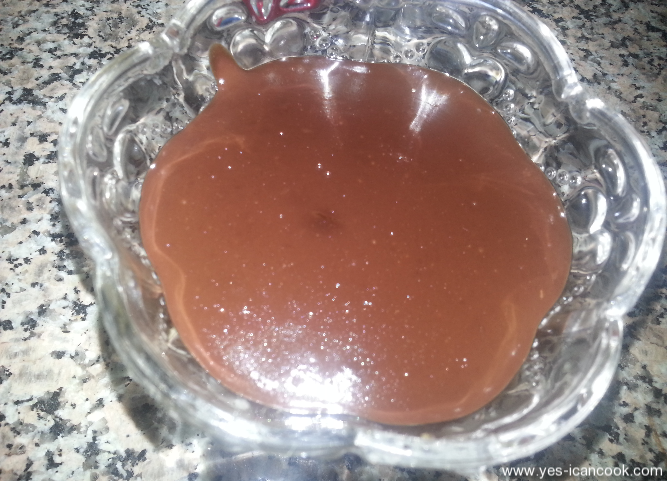 In another small bowl add cocoa powder, custard powder, sugar and 60 ml milk and mix well to form a smooth paste without any lumps. Keep aside. 6. Switch off flame. Let it cool down just a bit. 7. 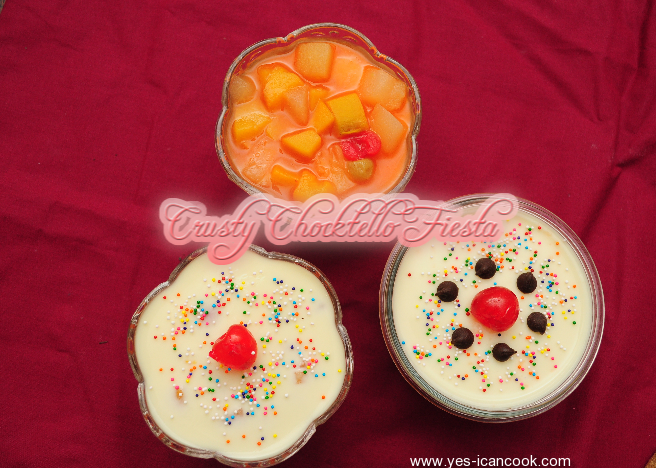 Remove the serving bowls from the refrigerator and pour the chocolate custard on top of the crust. 8. Let it cool down completely. Cover with the same cling wrap and refrigerate again while you make the next layer. This should refrigerate for a minimum of 30 minutes. 1. In a small mixing bowl add cold water. 2. Sprinkle the gelatin on top of the cold water and leave it aside for 5 minutes. 3. In a large mixing bowl add the condensed milk. 4. 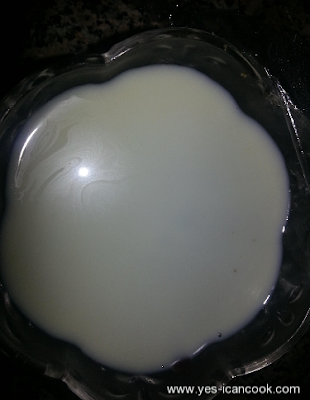 To this add 1 cup of boiling hot water. 6. Add the swollen up gelatin and mix well to combine. 7. Add the remaining 1/2 cup of boiling water and mix well to combine. 8. Let it cool down to room temperature to use. 9. 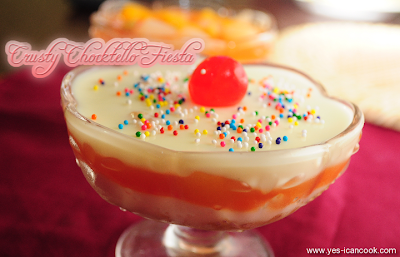 Use this condensed milk jelly for 2 layers. 10. 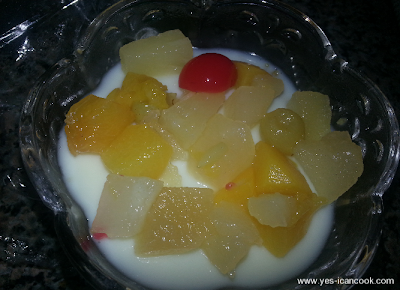 Add half the condensed milk jelly to another bowl and keep aside for later use. It will not set till the time it is refrigerated. However keep stirring it now and then. 11. Remove the bowls from the refrigerator. Use one half of the condensed milk jelly and pour it on top of the chocolate pudding layer. 12. Cover again with same cling wrap and return to refrigerator. It will take 15-30 minutes to set. Prepare the next layer. 1. If using fresh fruits, wash, peel, core, deseed as required. Cut fruits to small pieces. Mix well in a bowl. Add a tablespoon of sugar and mix if desired. 2. If using canned fruit cocktail, separate the fruits from the syrup using a mesh or colander. 3. Remove the bowls from the refrigerator. 4. 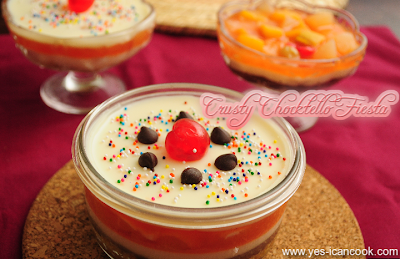 With the tip of your finger touch to check if the condensed milk jelly layer has set. 5. 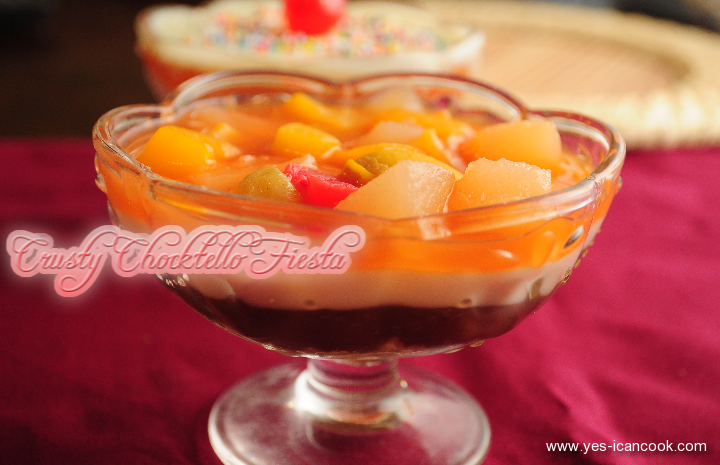 If it is set add the fruit pieces without any juices or residual liquid and spread to form a layer. 6. Cover and return to refrigerate while you prepare the other half of this layer. 1. Take cold water in a small bowl. Sprinkle unflavored gelatin powder over the cold water. Keep it aside for 5 minutes till the gelatin swells up and becomes spongy. 2. In the meantime, pour the prepared Tang in a saucepan and heat it over low flame. It should not boil. Add sugar if desired. Stir the sugar to dissolve. 4. Add the gelatin to hot juice and stir well till it has completely dissolved. Again do not boil. 5. Take it off heat and let it cool down completely. 6. Remove the bowls form the refrigerator and pour the fruit juice jelly over the fruit pieces. 7. Cover again with the same cling wrap and return to the refrigerator to set. This will take anytime between 30 minutes - 1 hour depending on your refrigerator. 8. If you have any juice remaining then you can set it in separate bowls or moulds to enjoy later. 1. 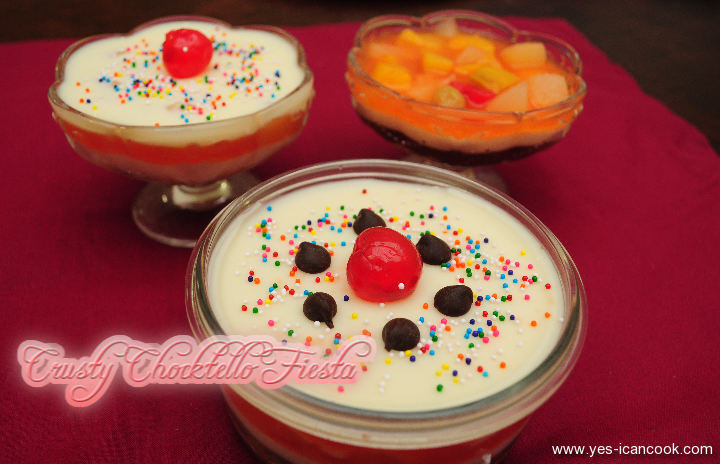 Use the reserved condensed milk jelly. 2. Remove the bowls from the refrigerator and with the tip of your finger check if the jelly has set. If it has not then return it back to the fridge till it sets. 3. Pour the condensed milk jelly on top of the fruit juice jelly layer. 4. Cover with the same cling wrap and return to the refrigerator to set. This takes about 15-30 minutes. 6. You can pour this condensed milk layer over the fruit juice jelly when it has 75% set to give a nice marble pattern. 7. If this is your final layer then set for 3-4 hours before serving. Overnight is even better. 1. 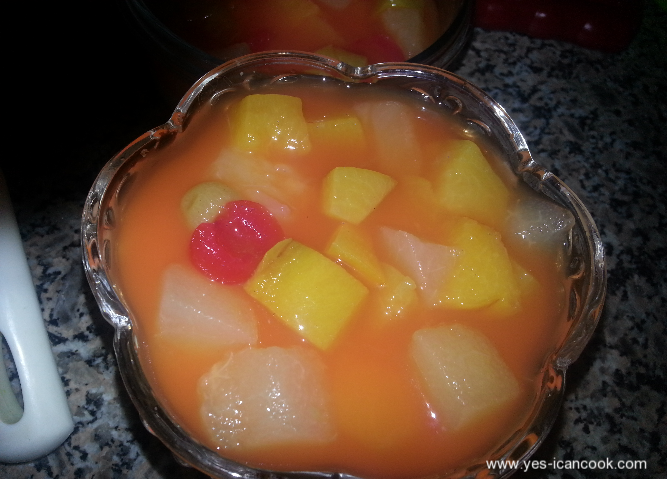 If the fruit cocktail jelly is your top layer then serve it as is. 2. If the condensed milk jelly layer is your top layer then it is like a white canvas, you can design it the way you want. Add a glazed cherry or chocolate chips or colorful sprinklers or any syrup of choice. Serve chilled straight out of the fridge. Thank you very much Resna. Thanks Priya. It sure is. Have a virtual spoonful Swetha.